Those responsible for the death of a giraffe whose head struck a South African highway overpass while they were been transported in a truck should be prosecuted under animal protection laws. . The accident on a highway between Pretoria and Johannesburg (South Africa) last week Thursday was very unsettling because this could have easily been avoided and so unnecessary. The Society for the Prevention of Cruelty to Animals group’s members were able to respond quickly to the giraffe accident because they were already out on the highway attending to a separate case of cattle stranded because of a truck breakdown. Prior to the giraffe accident, startled motorists took photographs of the truck, which was carrying two giraffes and noticed those long necks were visible above the top of the trailer as they passed the caring the giraffes. The other giraffe appeared to escape injury by millimeters because it was slightly shorter than the animal that was hit. Besides this, the very same truck broke down earlier for hours on the side of the road. Animal welfare officers have interviewed witnesses and obtained documents from nature conservation officials who had issued permits for the transport of these giraffes. The investigation includes determining where the giraffes were being transported from, as well as their final destination. The transport company should be held fully responsible for irresponsible methods of transport and should be prosecuted. 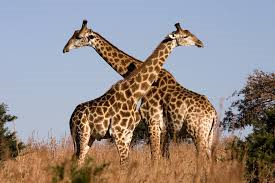 This entry was posted in Giraffe, Wild Species. Bookmark the permalink.